A website for digital agencies and design studios should leave a lasting impression and thus it is important to have a creative and modern design website for such agencies and businesses. 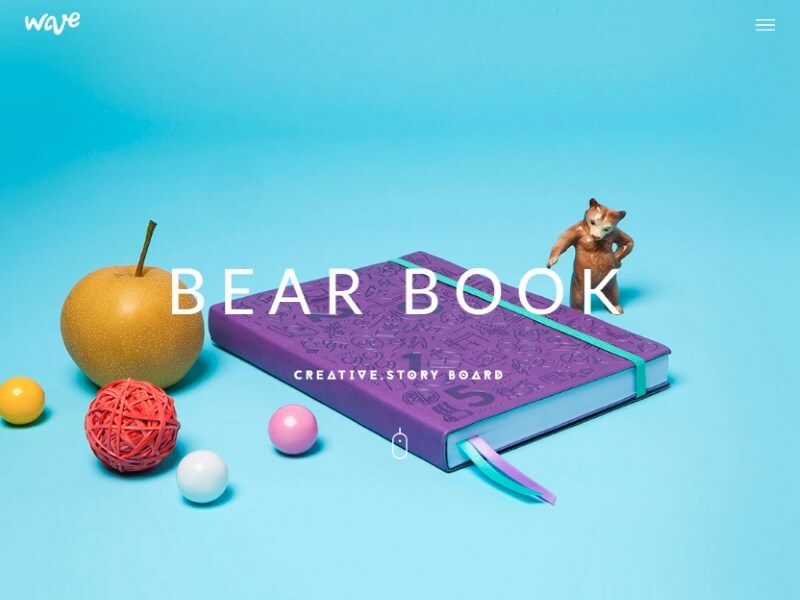 In order to help you setup a modern looking portfolio, we have brought together some of the most creative digital agency website templates in this post. Our collection of creative agency HTML templates is divided in two parts. 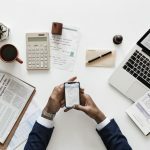 In the first part you will find some of the best website templates for digital agencies that you can download for free. 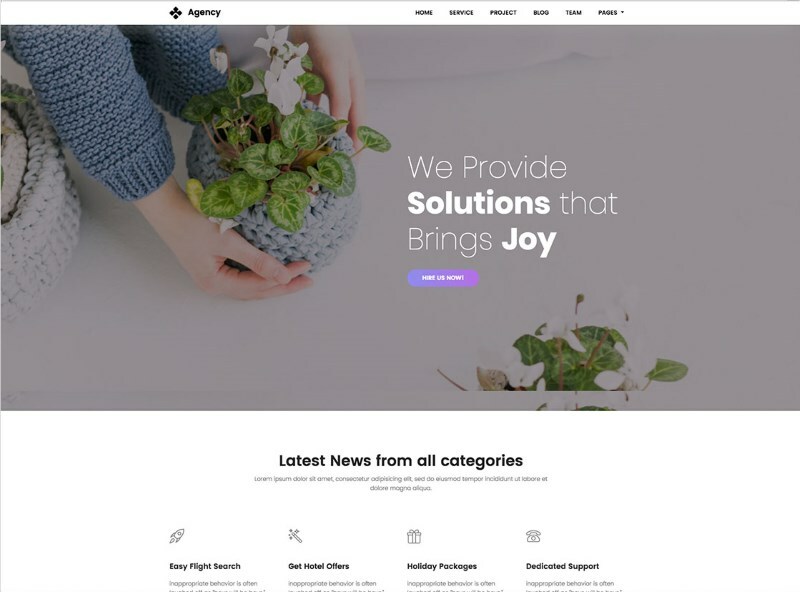 In the second part, we have hand-picked a selection of premium agency website templates from popular marketplaces such as WrapBootstrap, ThemeForest and Creative Tim. These premium templates often include full documentation and support from developers. 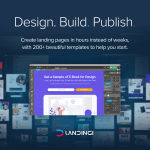 Find below freely available HTML templates that are a perfect fit for creating landing pages of digital agencies and companies. 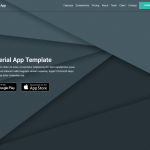 Most of these templates are built with Bootstrap and are easy to setup and customize. However, do note the licenses before downloading these free templates. 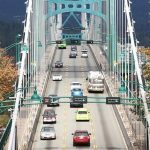 If you are working for a client, do take a look at our premium collection found later in this post. 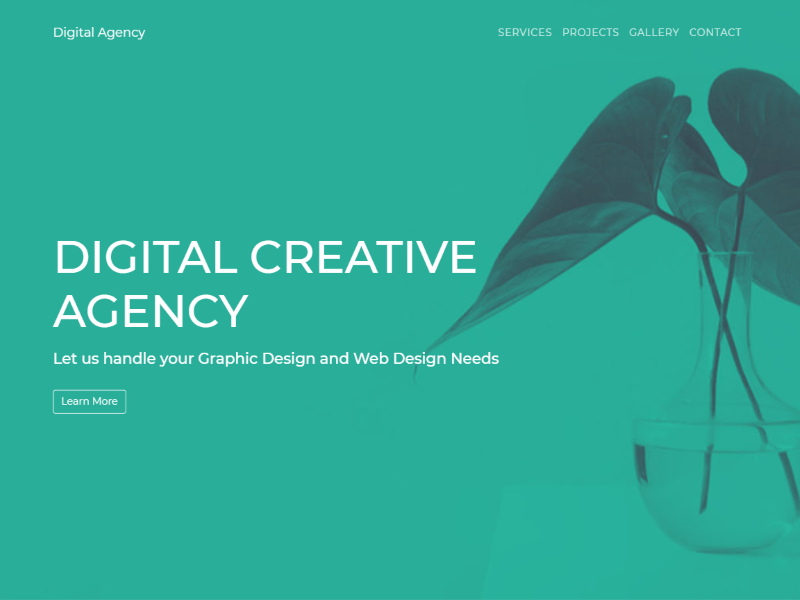 Digital Agency is a free HTML template suitable for creating landing pages and websites for digital agencies, marketing agencies, design agencies or for any other product and services. Built with Bootstrap 4 by TemplateFlip, this fully responsive website template is easily customizable. 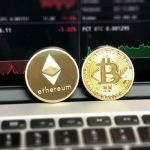 The template also has eye catching animations that get played on user scroll, increasing the engagement of your website visitor while leaving a lasting impression. 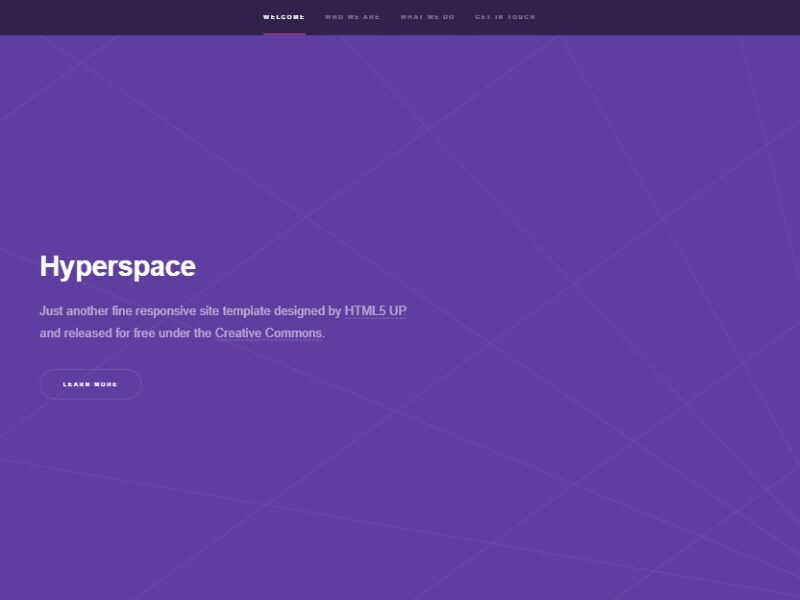 Hyperspace by HTML5 UP is a colorful and modern agency website template. Though not built with Bootstrap, this beautiful template has a vertical navigation menu and smooth scroll animations. A contact form and address section are also provided along with ‘who we are’ and ‘what we do’ sections. 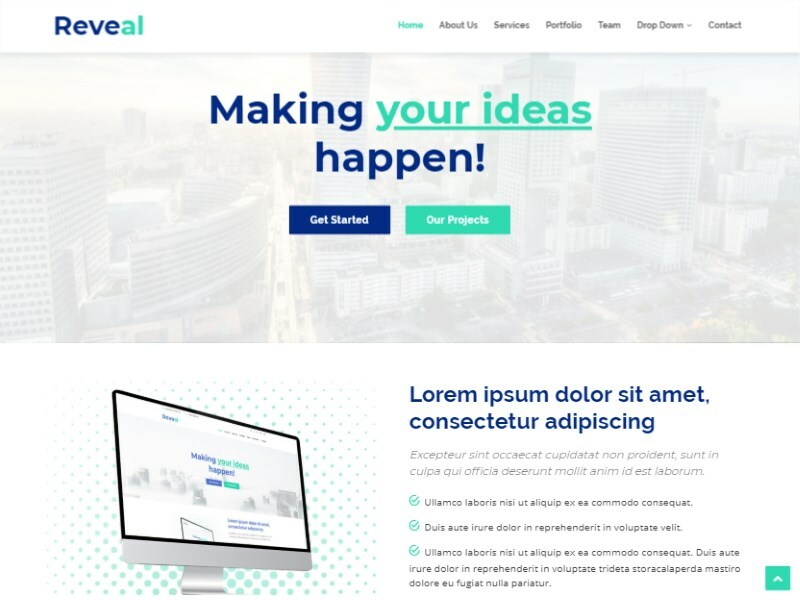 Reveal is a creative business Bootstrap template suitable for businesses, companies and corporate related websites. 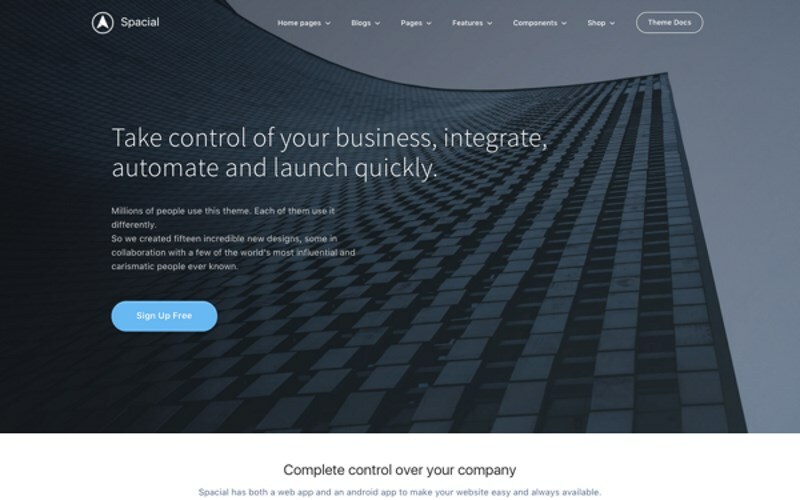 Reveal is built by BootstrapMade and follows the latest trends and modern design ideas in the web design industry. 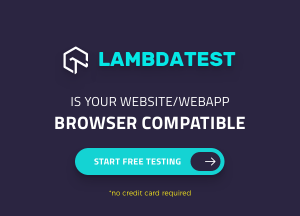 This free theme can also be used for creative individuals, agencies, consultancy firms, startup organizations or anyone who wants a quick presence on the web. 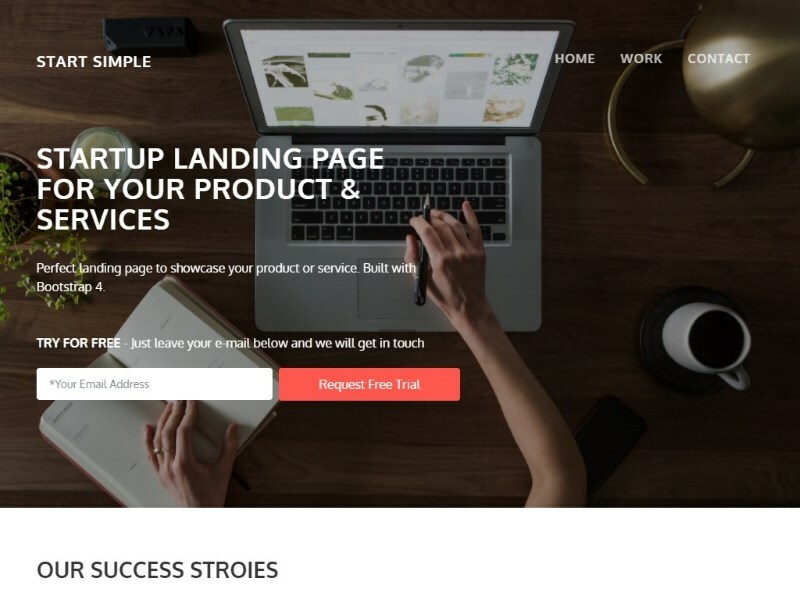 This is a free landing page template for startups, small businesses or agencies built with Bootstrap 4 by TemplateFlip. The template offers a parallax like scrolling image in header, a portfolio section, a responsive animated slider for user testimonial section and a contact/about section. This free Bootstrap corporate template is free to use for both personal as well as commercial projects. It supports video backgrounds and parallax like scrolling effects. 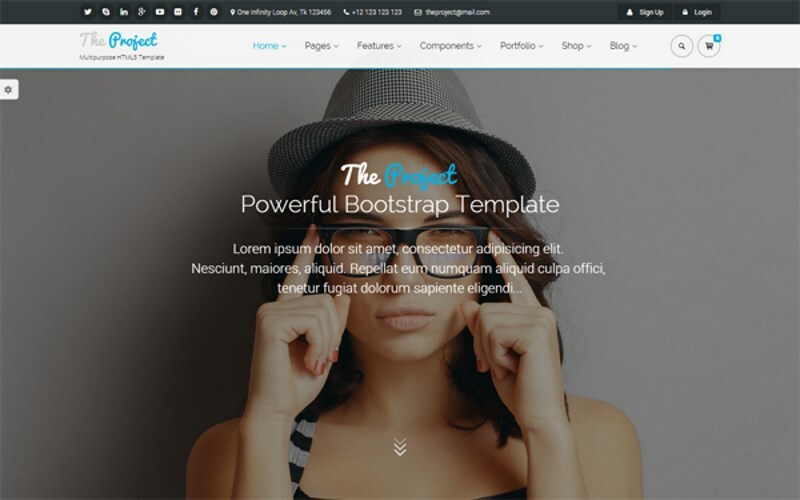 This template is built with Bootstrap 3 and Font Awesome by DesignBootstrap.com. 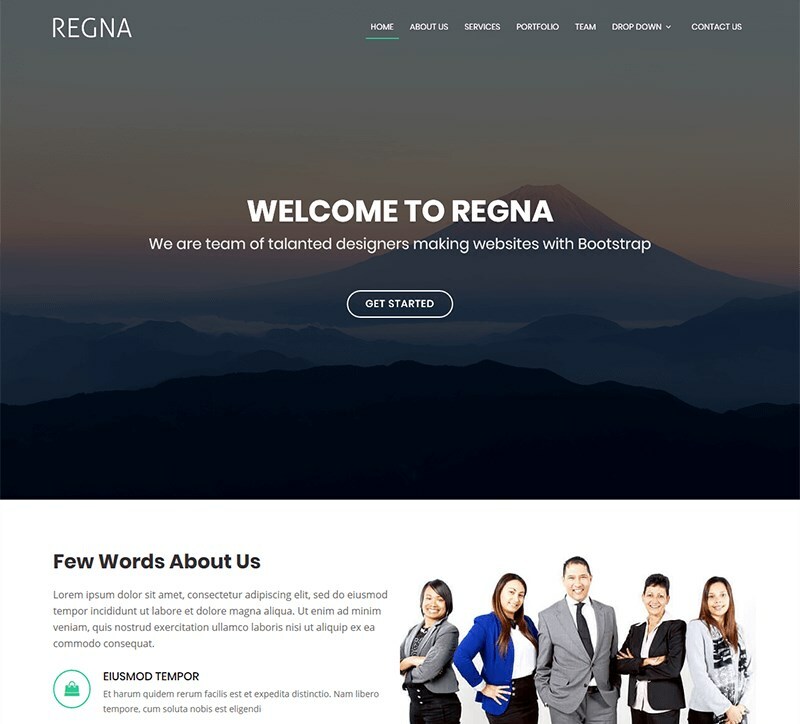 Regna by Bootstrapmade is another free Bootstrap 4 template designed for any type of corporate, business or agency websites. It’s a one-page template with clean and responsive design. It has sections for services, portfolio, team and contact form. 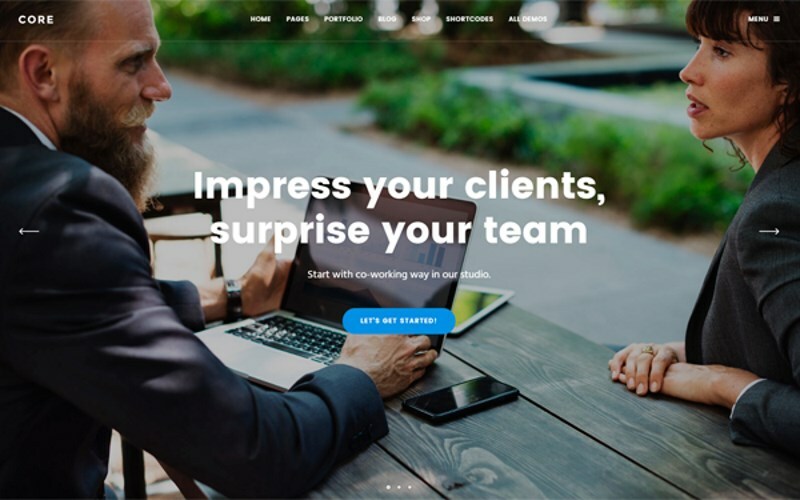 This creative agency website template is built by Colorlib and is available for free download and use in personal as well as commercial websites with credit. The template has a large parallax scrolling header with a call-to-action (CTA) button. Other sections of this free creative and marketing agency website template are ideal for services, projects and team introduction. 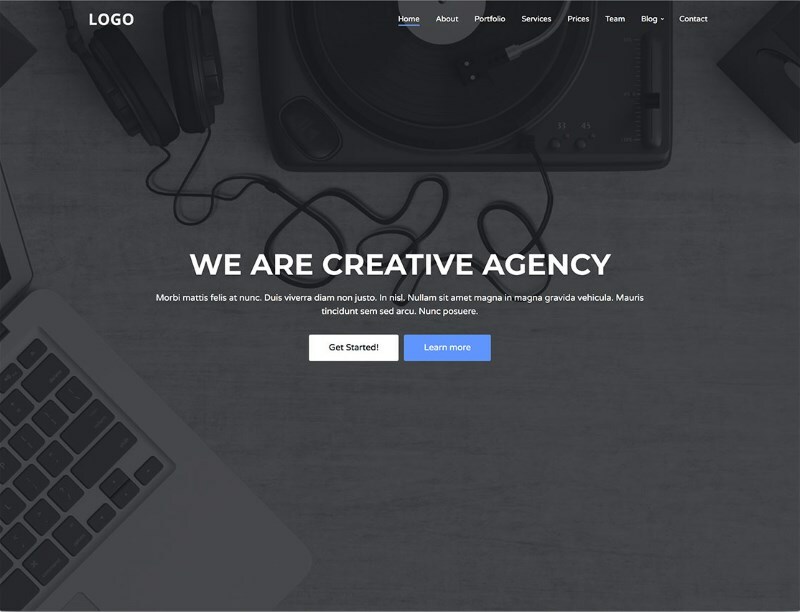 This another free digital creative agency website template by Colorlib. 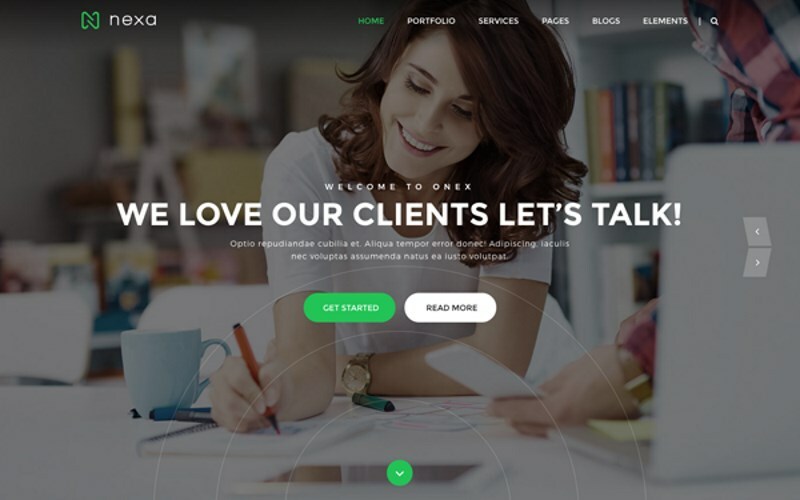 Featuring large header image and a sticky header menu, this template has multiple sections suited for portfolio sites of agencies and companies. 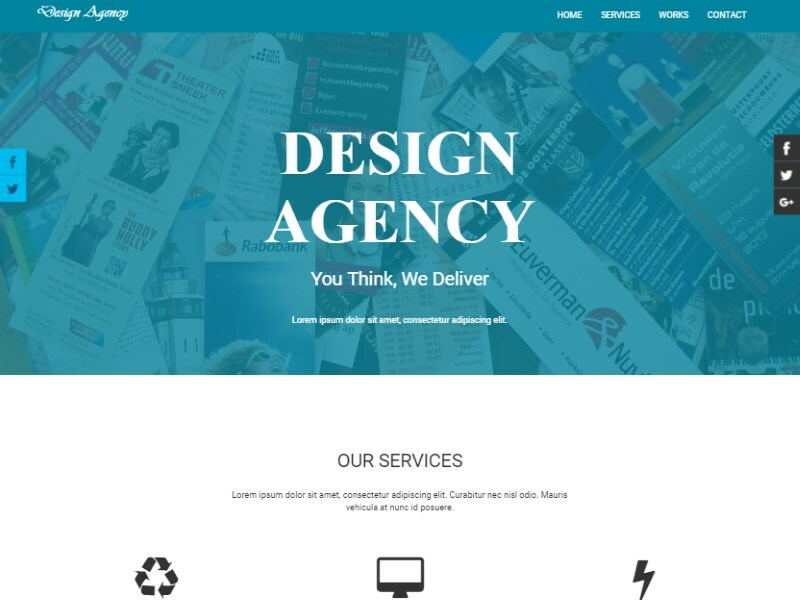 This is a free advertising agency website template by Themezy. Showcasing a contemporary uncluttered design, this free template has multiple pages including projects, services, about and contact page. 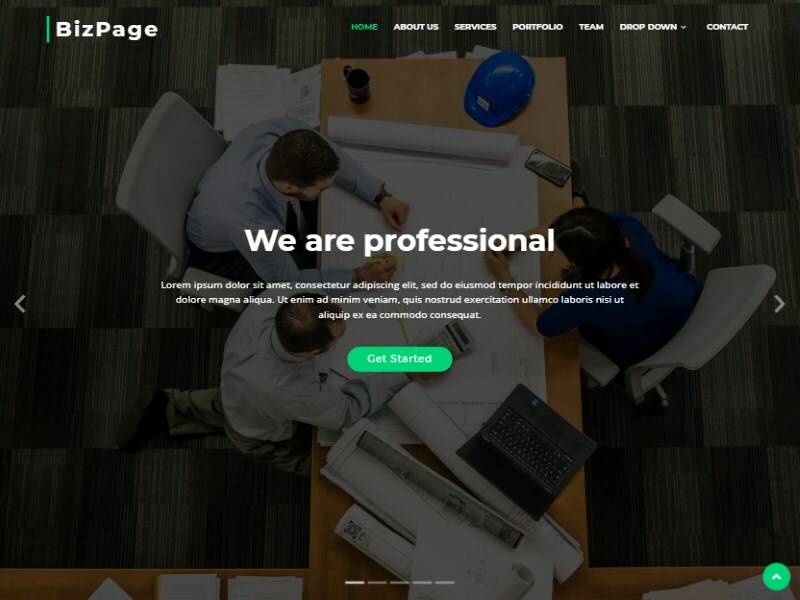 BizPage is a modern and creative multipurpose corporate Business HTML 5 template built with Bootstrap 4 framework. The template features animated scrolling, off-canvas mobile menu, portfolio with light-box support, testimonials carousel and a lot more. 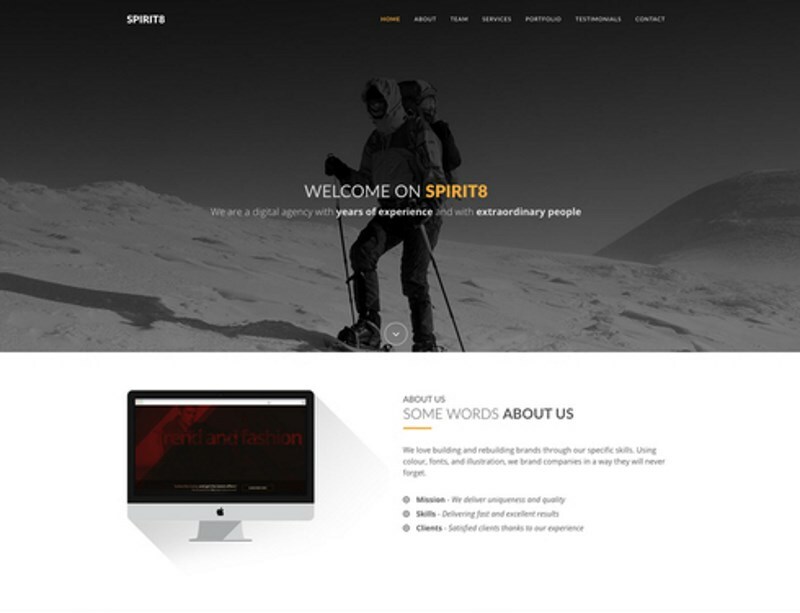 Spirit8 is a free template offered by Themezy and is a fully customizable template that you can use to present your agency’s service. The template has a simple black, white, and mustard color theme which will complement most types of businesses. Built with Bootstrap, it’s fully responsive so it will look great on any device. 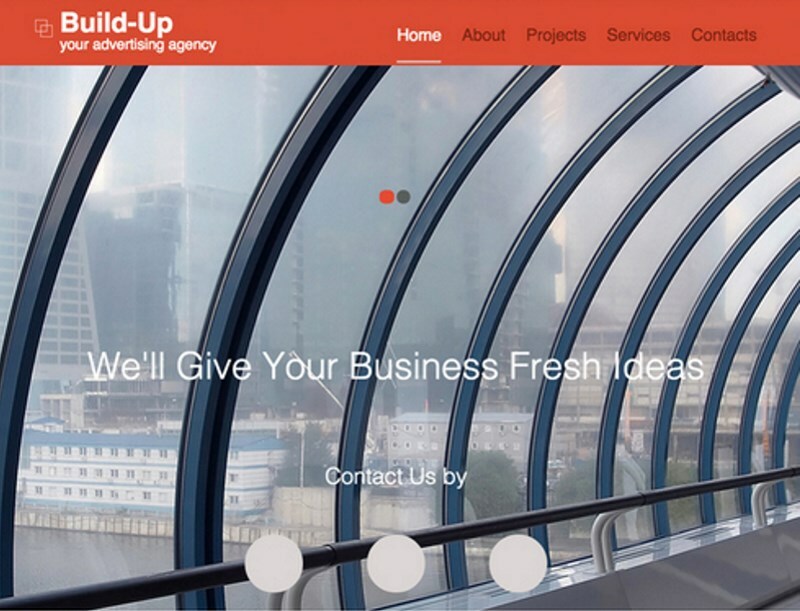 Find below collection of premium and best selling agency website templates. 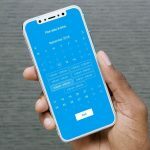 These templates allow commercial use and are recommended for freelancers and web design studios as they can be used for commercial purpose such as making websites for a client. 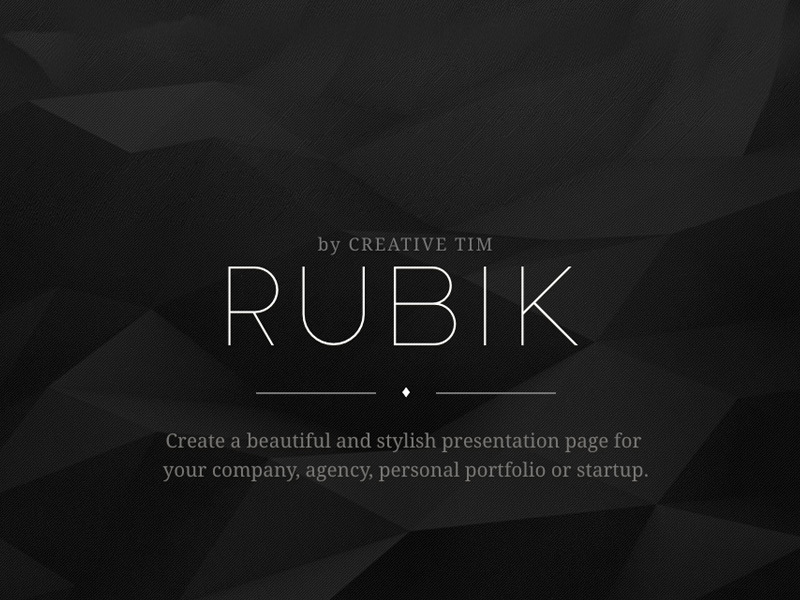 Rubik is a premium one page website template which can be used to create beautiful and stylish landing page for companies, agencies or startups. 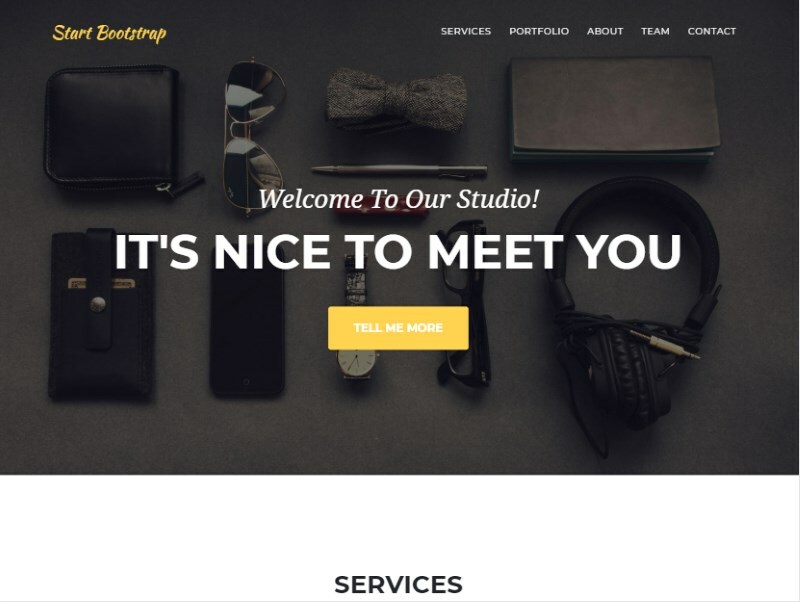 Built with Bootstrap, this website template has 47 handcrafted components such as portfolio, team profile, contact form, Google maps and many more suitable for landing page design. 4 pre-built example pages are included to get you started with building websites for agency, company, startup or a portfolio website. 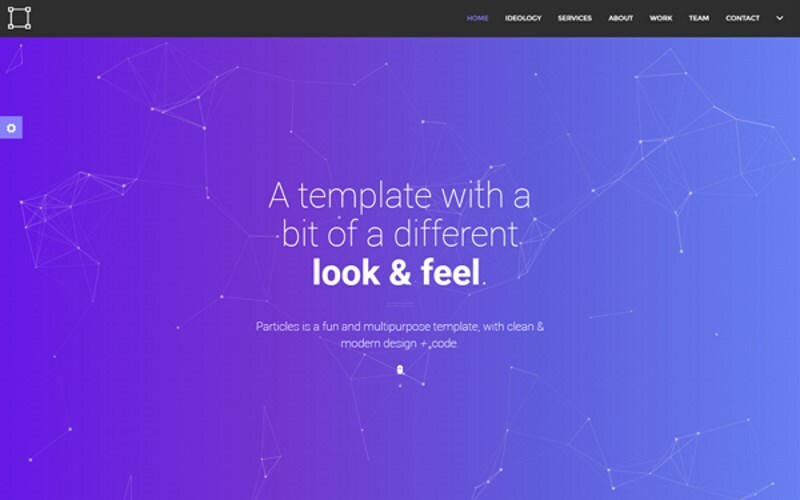 Particles is a flexible and responsive agency template with 2 base colors (light and dark) and 8 main color options. Built with Bootstrap 3, this template includes animated particles header and also supports parallax backgrounds and text rotation. 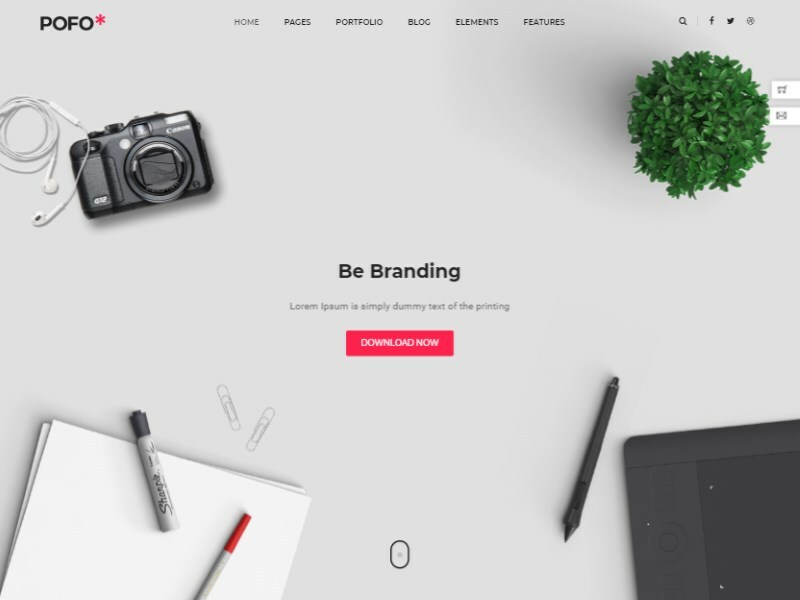 Spacial is a set of 100+ unique multipurpose Business, Startup, Agency & Shop templates. It has a modern design and all the template pages are fully responsive. It comes with Gulp build tools integrated to help you automate compiling, minifying & optimizing CSS and JS assets after customization. Built with Bootstrap 4, this template has integration with Mailchimp Newsletter and supports panorama views & 360 images. The Project is a multi-purpose Bootstrap 4 HTML Template which includes 31 Homepage designs & 190+ HTML pages templates. Coming with RTL support, this template package has multiple header as well as footer options. This template package is perfect for designing websites of corporate, agencies, portfolio, gym or fitness, medical, construction as well as wedding websites. 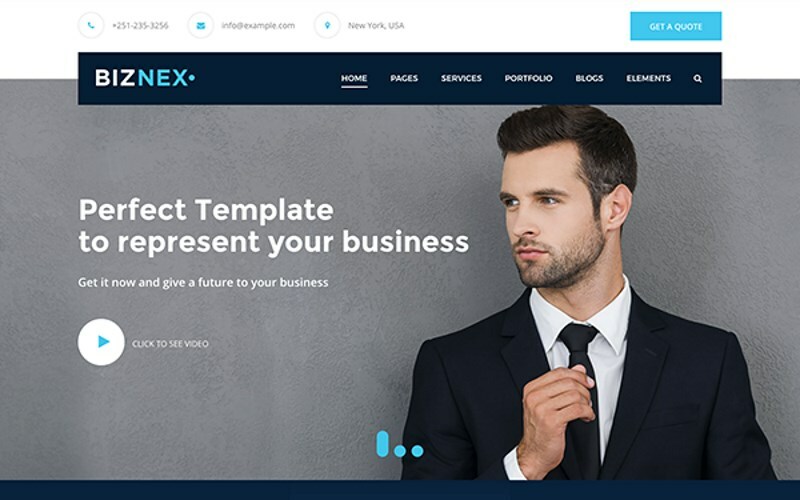 Biznex is a Bootstrap 4 based multipurpose business template that can be used to create any type of business websites like consultancy, finance, corporate and agency. Included in the template package are 30+ page templates along with full documentation and customization instruction. 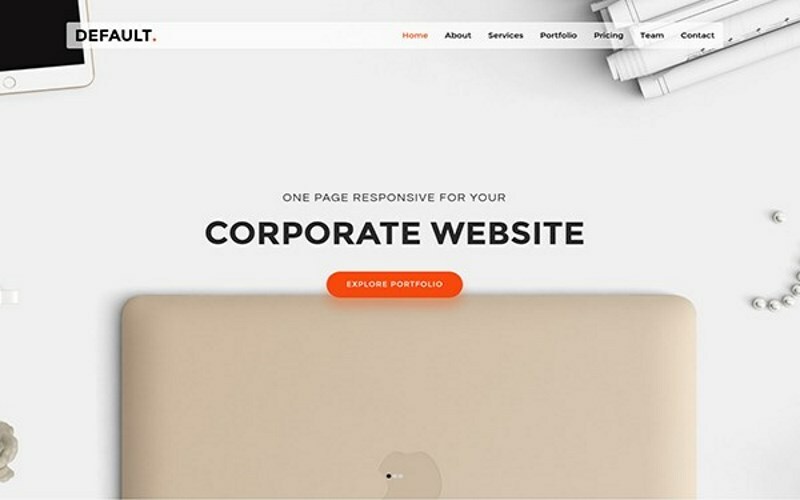 NEXA is a creative and modern portfolio template for corporate, agencies, freelancers, individuals to showcase their company history, services, work portfolio and projects in creative and professional way. Based on Bootstrap 4, this template includes Gulp development environment for customization and build support. 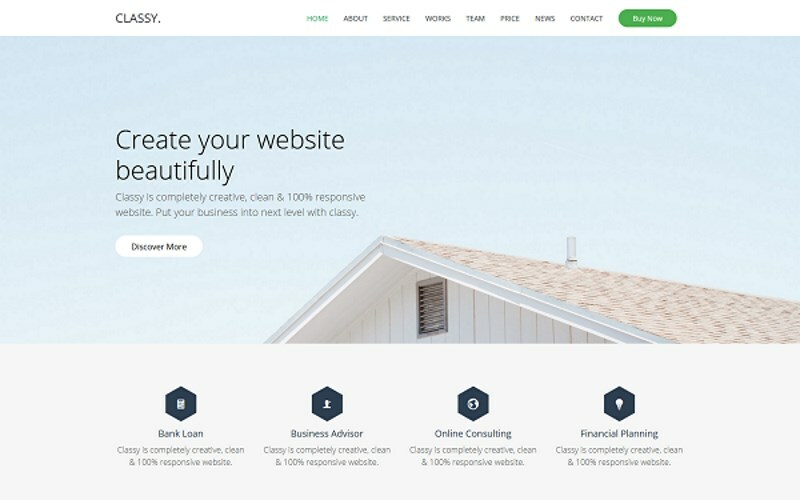 Classy is a collection of modern and responsive templates for Business, Agency, Startup, App Showcase, Resume & CV, Photography, Fitness & Gym, Medical & Cryptocurrency websites. 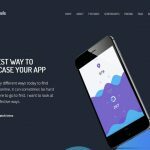 Built with Bootstrap 4, it has over 300+ demo pages, 230+ shortcodes elements, 30+ Portfolio Showcase, 24+ Blog Pages and many other features. 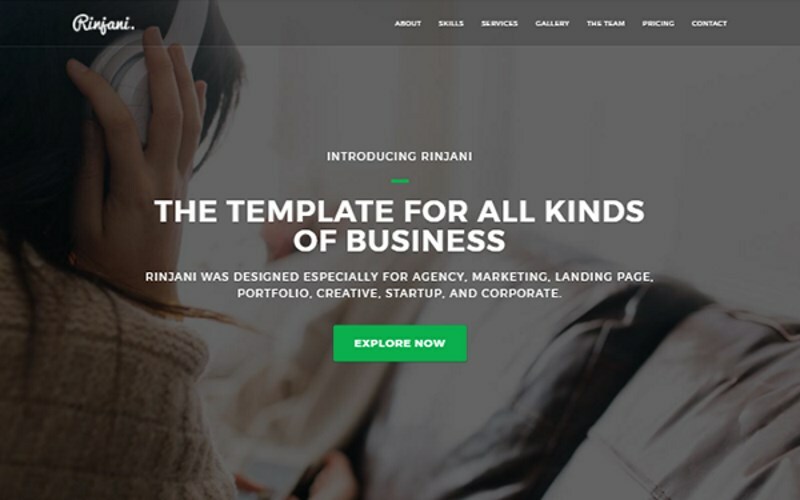 Rinjani is a clean, stylish and fully responsive landing page template for individual’s or business agencies. It has support for parallax background, video background and well as photo slideshow background. You will find 8 different color themes for this template and a working AJAX + PHP Contact Form. Core is clean multipurpose HTML5 template built with Bootstrap 4 framework. It has support for parallax, Youtube video, Vimeo as well as local video backgrounds. Moreover, it has support for multi-column mega menu, offcanvas side menu, lightbox gallery and many other features. 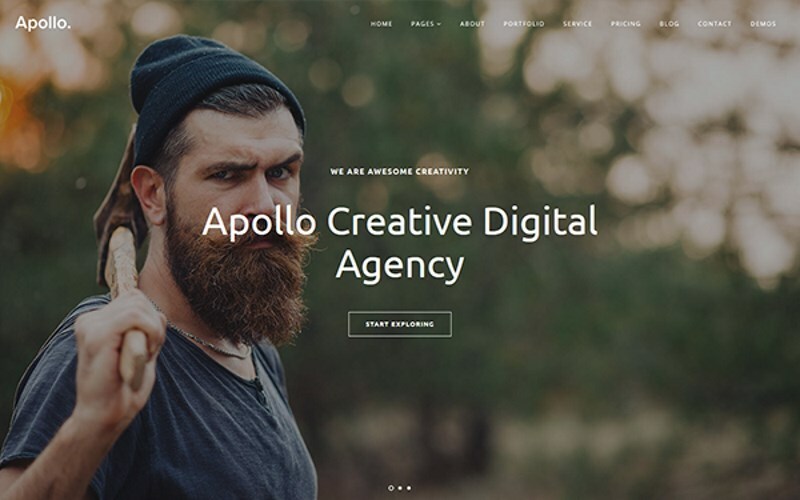 Apollo is a creative one page HTML Template perfect for any type of business like digital agency, creative people, photography, personal resume, freelancers and portfolio. It has 12 intro variations and 7 different homepage Layouts, 6 header variations and 15 extra pages. It also has working AJAX & PHP contact form and working subscribe form with Mailchimp. Wave is a creative agency & freelancer portfolio theme that fits all kinds of digital purposes. It has animated hero backgrounds as well as engaging CSS animations throughout the design. It includes a full screen navigation menu as well as support for revolution slider. 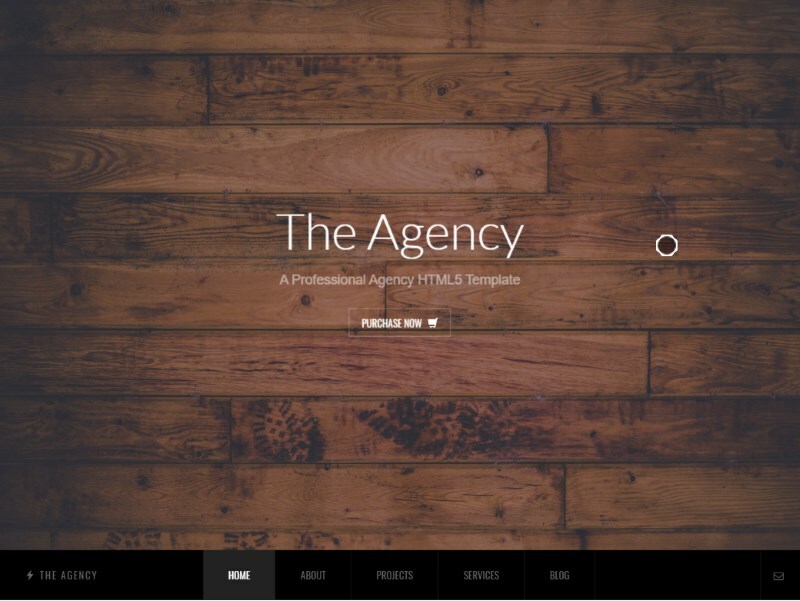 The Agency is a clean and responsive HTML5 agency template made for all sorts of businesses or freelancers. It’s easily extendable and comes with an easy-to-use responsive lightbox and a unique blog design. Pofo is a vibrant and fully responsive HTML5 and CSS3 multi-purpose website template for corporate, agencies, freelancers, individuals as well as any type of business to showcase their company history, services, work portfolio and projects. 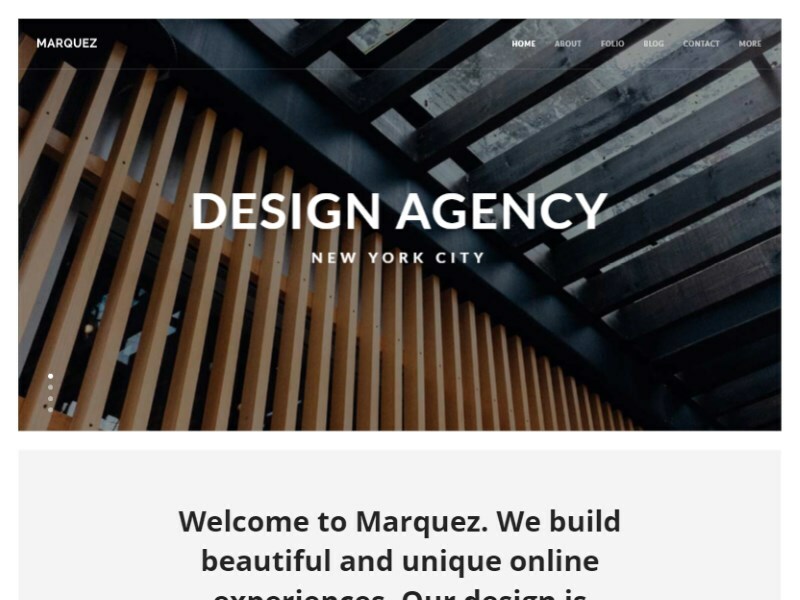 Marquez is a creative agency HTML template offering 25+ layout designs and having 8+ plugins and 20+ components built-in. Using the pre-designed component blocks, you can easily create new and unique layouts for yourself. Do you like our collection of website templates for digital creative agencies and design studios? 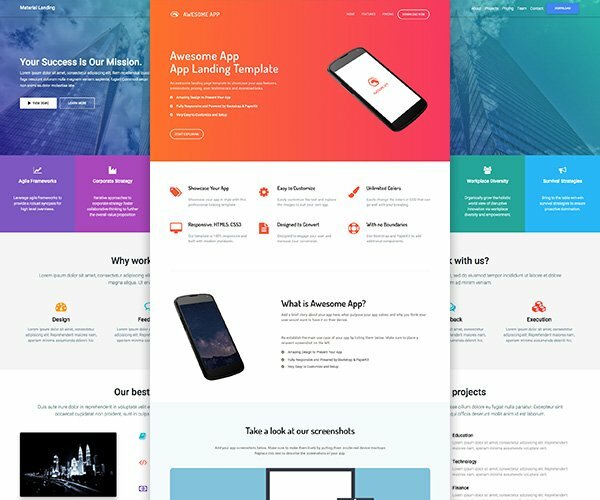 If you are looking for more website templates then take a look at these Bootstrap Business Templates. If you are a web developer then you may find these Bootstrap 4 UI Kits useful.